Let the Ghibli feast begin! 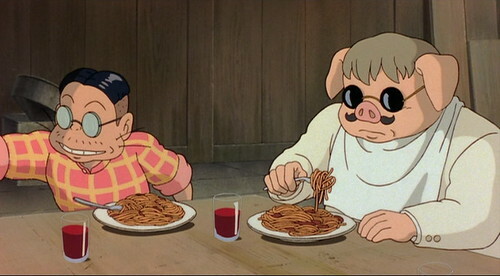 Our first Ghibli film was Porco Rosso. If I just said that the film was about a pilot who was cursed and turned into a pig in old Italy, it might sound like a comedy film or a cartoon for kids, but Porco Rosso is about a man’s dream, friendship and love. The first time I watched this film I giggled when Porco Rosso appeared. He was a really Â stocky talking pig. But as the film progressed, him being a pig became just one of his facial features. It was still a very important piece of the story, but it didn’t distract me at all. Who cares if he looks like a pig? When someone is living his dream and doing what he does best like Porco, you can afford to look like a pig. There’s a fish dish Porco eats at Gina’s club. They don’t mention the actual name of the dish, so we had to guess. We thought the fish was white fish at first, but after studying the screenshot, we both agreed the fish was probably salmon. 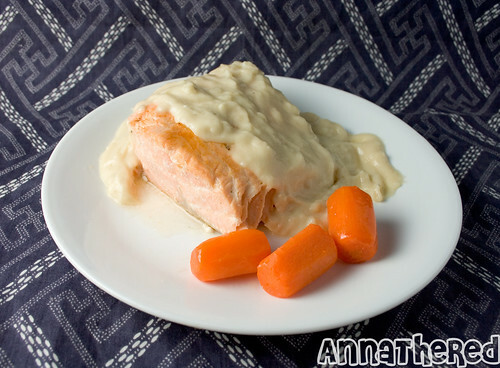 I searched for salmon with white sauce dishes online, and found many “poached salmon with Bechamel sauce” recipes. Bechamel sauce is a French white sauce, but the sauce is also used in many recipes of the Italian cuisine, so we thought it was acceptable.Â I used a Bechamel sauce recipe with onions so the sauce would have some chunky stuff in it. For the carrots I cut, peeled and cut the corners off then glazed them. We’ve never made poached salmon before but the instructions were very simple and easy, so my boyfriend decided to cook the salmon. He first put 3 tbs lemon juice and 1 tbs olive oil in the pan then put about an inch of water in. After placing the salmon in he filled the water so it was just covering the salmon. Then he set the heat to around medium so that it was steaming, but not bubbling and cooked for about 6-8 minutes. That’s it! On Friday the day before the feast we went to look for Italian wine with the label that was on the wine in the film, but most of them had a modern looking label or, err, were out of our price range… So, I ended up going to the farmers’ market in Union Square on Saturday morning, and got two bottles of wine from Chateau Renaissance Wine Cellars. I’m not a wine expert and can’t describe how good wine should be, but all I know is that I’ve had their wine, and I liked it a lot. Also their label looks like it was hand painted in water colors and very charming. After everything was ready, we placed each food on the plate just like the dish in the film, and took pictures. This was our first attempt. Not exactly like the one from the film, but it was DELICIOUS nonetheless. For the sake of the look, the salmon probably could’ve been a little wider and the surface should’ve been cooked more. In other words, it might not have been poached salmon…? But both the salmon and sauce came out really really nice! The poached salmon absorbed the flavor and it was so moist inside. 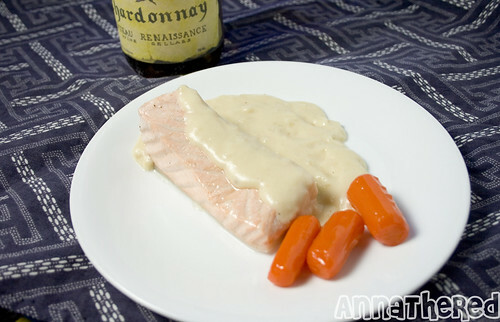 The Bechamel sauce was very creamy and rich, and went very well with salmon. We’ll definitely make this dish again. Still, when I was writing this post, I couldn’t help but feel that I didn’t try my best to make the dish as close as possible to the original…Â So I made it again for tonight! Our second attempt! 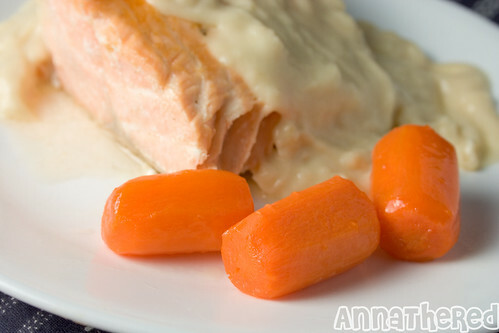 Pan seared salmon with Bechamel sauce. Nice and brown on the surface, very moist on the inside. I love glazed carrots. It's like vegetable candy. 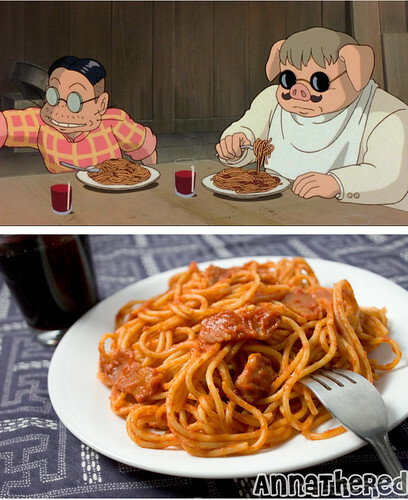 When Porco visits his old friend to repair his plane, there’s a scene where they eat pasta together. 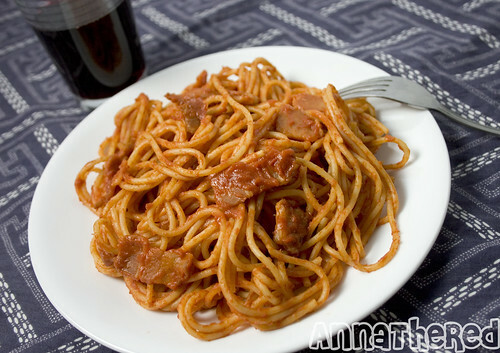 Very simple pasta with tomato sauce, and you can see some reddish food mixed in the pasta. They talk about the old days and drink red wine from regular glasses. Very casual and laid back. So I figured the pasta would be something simple and made with ingredients you can find in the fridge. I thought the reddish food could be bacon, but would a pig eat bacon? Well… He always drinks wine, and smokes cigars all the time. I bet Porco probably wouldn’t mind eating bacon. I cut strips of bacon and mixed it with tomato sauce and pasta. 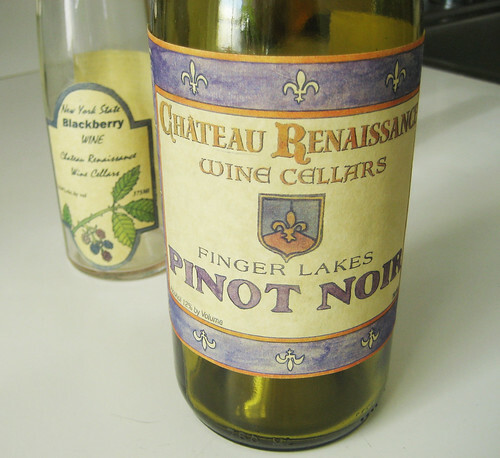 I served the pasta with some Pinot Noir I got from Chateau Renaissance Wine Cellars. Nothing fancy, but it reminded me of the spaghetti my grandma used to make. We didn't put a napkin around our neck though. We are definitely not as classy as Proco Rosso. Yes, we had two dinners in 2 hours! But we knew there would be a lot of food before we started this Ghibli feast, so we cooked each dish in very small portions.Â Overall, we were satisfied with the dishes. The wine definitely helped making us feel like a cool pig who loves good food, good wine and flying. The next feast is Princess Mononoke! Great work! 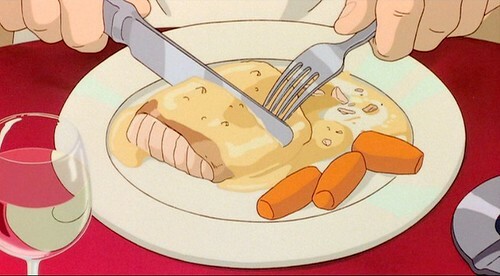 I’ve always loved the way food looked in Ghibli films. Just a suggestion for the salmon dish. . it may be an encrusted fish dish (thus the random lumps and brown edges). 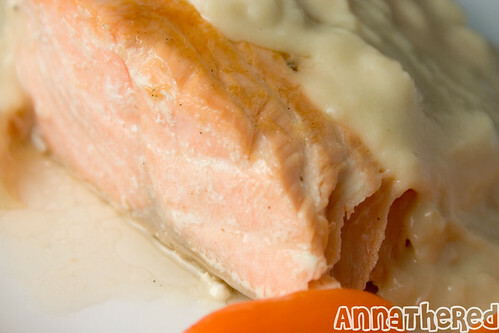 I’ve made an almond encrusted baked salmon before with Bechamel sauce and it’s really yummy! I wonder if the dark part of the fish is the skin in the movie? Crispy salmon skin is delicious. This is such a cute idea! The salmon looks delicious..
All the dishes look mouth watering… especially the salmon. You’ve done a great job! I’ve never watched this movie before, eventhough I’ve watched most of Ghibli’s… must hunt LOL. An almond encrusted baked salmon with Bechamel sauce!? That’s Brilliant! I’ve never cooked it before but I’m already salivating just thinking about it. I’ll definitely try it next time! I love crispy salmon skin too, and we actually thought that the brown part could be skin, but we decided to go with pan seared salmon this time. Maybe we should try salmon with crispy skin after an almond encrusted baked salmon! …okay, we just love salmon. We’ll use any excuse to eat salmon. Porco Rosso has a very laid back feeling to it, but it doesn’t mean it’s not good! It’s quite deep (in a not preachy way) in my opinion. I’m sure you’ll fall in love with Porco by the end of the film. 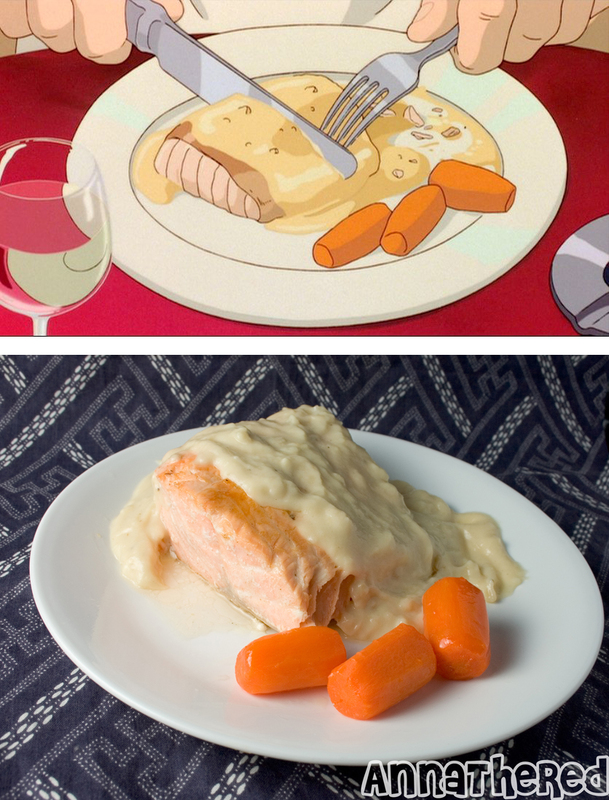 I’m sorry, as a french girl, I can say that the salmon’s sauce must be another one, called “beurre blanc” (it is yellow while bechamel is near white, and beurre blanc has things in it like you can see on the Ghibli picture, not bechamel). It is a sauce that is made in all the towns settled accross the Loire (the biggest river in France), especially for fish, especially for salmon. Some people prefer to strain the sauce and take off the little parts of shallots, but I don’t. And in the recipe of Ghibli image, shallots can be seen. You must keep it in double boiler until you serve it. You can’t reheat it after, you can’t cook it another time. One shot sauce ! Eat the sauce between 24h. The taste of this sauce is strong. Bechamel is a very good sauce too, but we use it more with potatoes, or artichokes, any vegetables, or fishes like cod or smoked haddock. For double boiler : the boiler with water must be on a medium fire, to keep the water boiling little by little. This is very late considering this was posted 5 years ago. But I think the red might be capsicum or tomato slices Capsicum seems a little more likely considering the tomato sauce. Bacon in pasta sounds delicious though! Well this comment is a few years late, but the reddish bits in the spaghetti may just be tomatoes. We typically add peeled san marzano tomatoes and when they’re mixed in with the rest of the sauce they don’t look as bright as normal. Fun Link Friday: Anna the Red « What can I do with a B.A. in Japanese Studies?